'I was out hoping to see my first aurora after waiting five years now for the Solar Minimum to pass. Thanks to widespread cloud, I missed anything special except this very faint green aural glow. 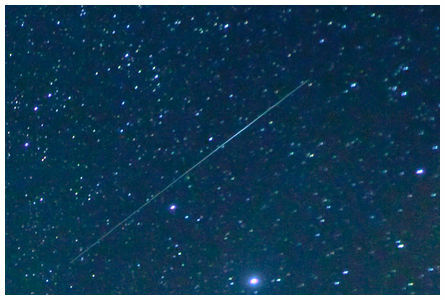 On checking my images I spotted what I believe is a flash of sunlight reflected of an Iridium communications satellite as it passed overhead at 23:29 on 14 February 2010' wrote Geoff. 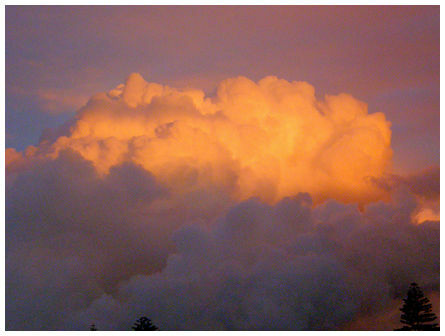 'Sunset over Yatton Park, Greerton, Tauranga at 20:10 on 25 February 2010. 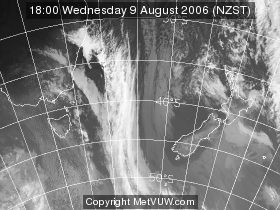 Camera pointing North East. Wind from the North about 2.5kph. Taken with Olympus SP-55OUZ using guide, set on sunset' wrote Phillipa. A huge thunder storm hit Melbourne yesterday, Saturday 6 March 2010. It caused flooding in some downtown areas and massive disruption to traffic around the city. Areas in west Melbourne reported hail the size of golfballs. 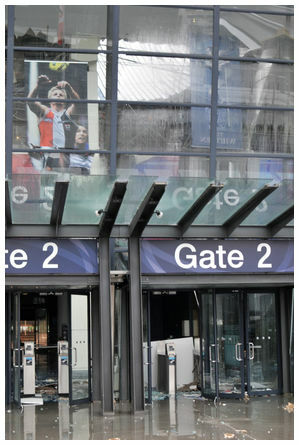 James took this photograph at the Etihad Stadium; it shows part of a roof collapse at Gate 2 due to the weight of the hail. Hailstones had been swept up in piles and lay all around the stadium. Southern Cross station was closed to commuters for a time because of concerns about hail damage to its roof. The All Blacks are scheduled to play Australia at the Etihad Stadium on 31 July 2010. 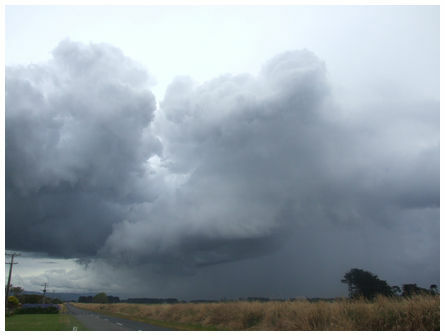 A thunder cell with various funnel clouds attached rolled across the central Manawatu plains early in the evening of 21 January 2010. 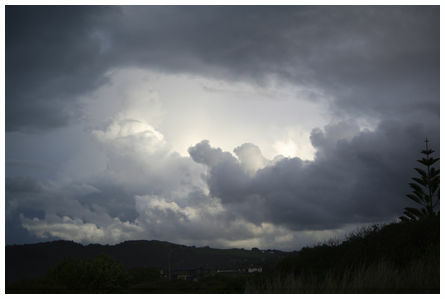 I took the photographs from my gateway at Glen Oroua looking west and then south as the cell crashed into the Tararuas. The swirling appendages below the centre were great to watch. It took about 30 mins to pass by. We have chosen one from a sequence of photos sent in by Ian, doesn't quite show the appendages that Ian refers to, but we liked this one. Jack wrote 'photo of the sunset of the new year on Mars! More truthfully, looking southwest from Hanmer Springs Campground at 21:20 on the 1 January 2010. After this awesome sunset with a ominous purple black sky to the east, the norwester that produced it kept me awake most of the night as it roared down through the pine trees on the hill. Panasonic Lumix on 'scenery' setting and slightly zoomed for cropping, which gave an exposure of 1/80 at F3.6. Lying awake listening to the gusts I'm sure they have quite a regular and quite long period, maybe three minutes?. 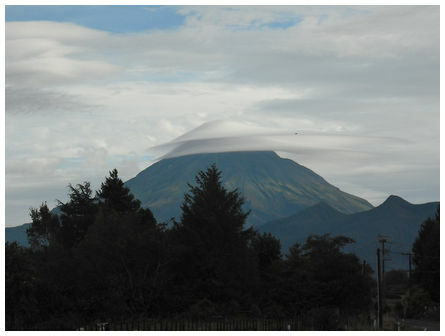 And I wondered if that related to the wavelength of vortices shed from the ridge? I've noticed the same effect at Kuripapango one night in the Hawke's Bay. The down slope gusts seem to become more severe and more regular at night, maybe because the random convectional gusts diminish? Or maybe you just worry about them more during a night in a tent? : Best Regards Jack Stanton P.S Thanks for the most excellent weather site! I use the predictions for deciding midweek if it's worth booking the aero-club Cherokee for a Saturday or Sunday flight. 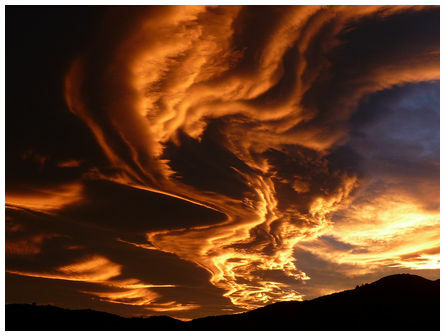 We have been sent a number of photographs of this sunset on 1 January 2010, Jack's is one of the most spectacular (JMcG).